Filmed by Bike audiences will have the rare opportunity to see the last bike movie shot on Kodachrome film. Kodachrome debuted in 1935 and was an instant hit as the first film to effectively, and later extremely vibrantly, render color. 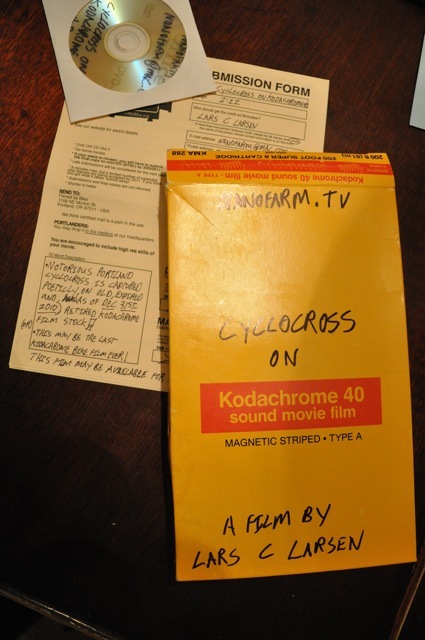 The very last Kodachrome processing machine was shut down in at the end of 2010, and filmmaker Lars C. Larsen, a veteran Filmed by Bike participant, managed to get one last film made before processing was no longer available. The result is “Cyclocross on Kodachrome 40”, a gritty, gorgeous cyclocross portrait set to a killer soundtrack (as Larsen’s films always are). “Cyclocross on Kodachrome 40” plays during all screenings of the Friday Night Program and in the Need for Speed Program of Shorts B. This entry was posted in biciculture, Festival, Storyboard, Submit your movie and tagged spot. Bookmark the permalink.